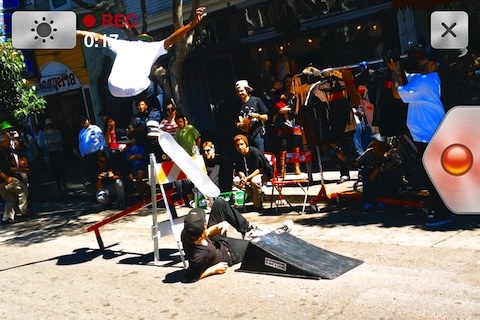 The Lumify iPhone app threads together bits and pieces of multiple videos into a neat, fun package. Forget editing. Forget adding effects. With just a few taps on your iPhone screen, Lumify does all of the hard work. The Lumify iPhone app does rely on an authorization with your Facebook account to access full functionality. When you issue the authorization, you can select the privacy settings for Facebook sharing. The Lumify iPhone app does state that it doesn’t post the videos you view, so you can feel confident you won’t have any embarrassing Social Cam moments in your feed. Your Lumify profile does incorporate your Facebook profile picture and simply shortens your name to your first name and last initial. Another important functionality you will want to enable is location services for access to your iPhone libraries. 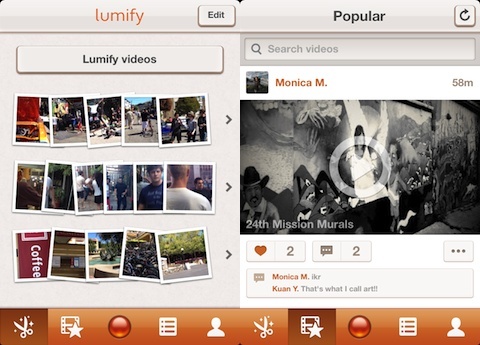 The foundation of the Lumify iPhone app depends on your selection of multiple videos to synthesize into one neat video. When you open the Lumify iPhone app for the first time, you can move step-by-step through creating your video with an insightful, nicely organized tutorial. Or, you can simply select the scissor icon in the bottom menu bar. You simply touch videos to use and wait for Lumify to process them. This process does take a couple of minutes, but you can watch the progress with the volume bar at the bottom of each video. The next step is to select music. You can use your own music, or you can use Lumify’s music. You name it, and you make decisions regarding sharing. You can share to Facebook and Lumify’s social network, or you can save to your camera roll. That’s it. The Lumify social network feed is a standard social networking feed with a strong visual presence. You can see the profile photo and name of the video creator, a still shot of the video, and a synopsis of social engagement. You can like and comment, as well as check out a Lumify user’s profile. If you like someone, you can follow them. The interesting touches are the ability to view the video in full screen mode with one touch from the feed and the chance to purchase the music in iTunes. If you are looking for a solid, easy video creation iPhone app, the Lumify iPhone app is a great choice. AppSafari review of Lumify was written by Jenni Ward on September 19th, 2012 and categorized under App Store, Free, Video. Page viewed 5204 times, 1 so far today. Need help on using these apps? Please read the Help Page.